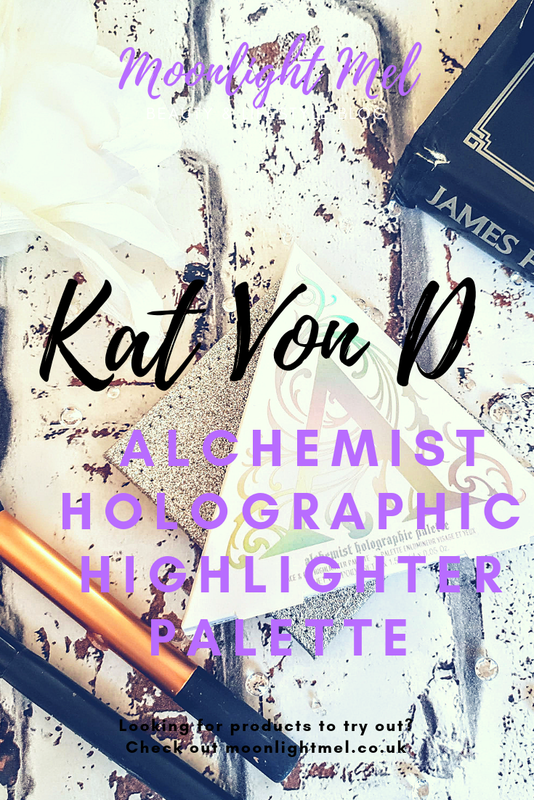 Ever since I bought the Kat Von D 10th anniversary 'Gold Skool' a few months back I have been hooked with the highlighters from the brand! I have a few different palettes from the brand now and for me personally, they are my favourites. 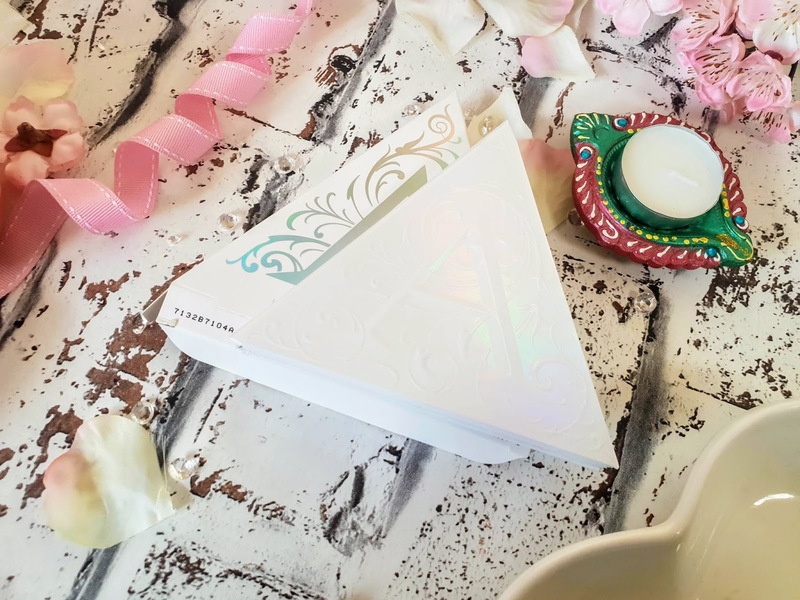 Today on my blog I will be talking about my Alchemist holographic palette. The alchemist palette is a unique half diamond palette with the letter 'A' embossed on the front of the palette. The design of the 'A' was inspired by her antique book collection. Inside the palette, they are 4 different highlighter shades that are holographically inspired. 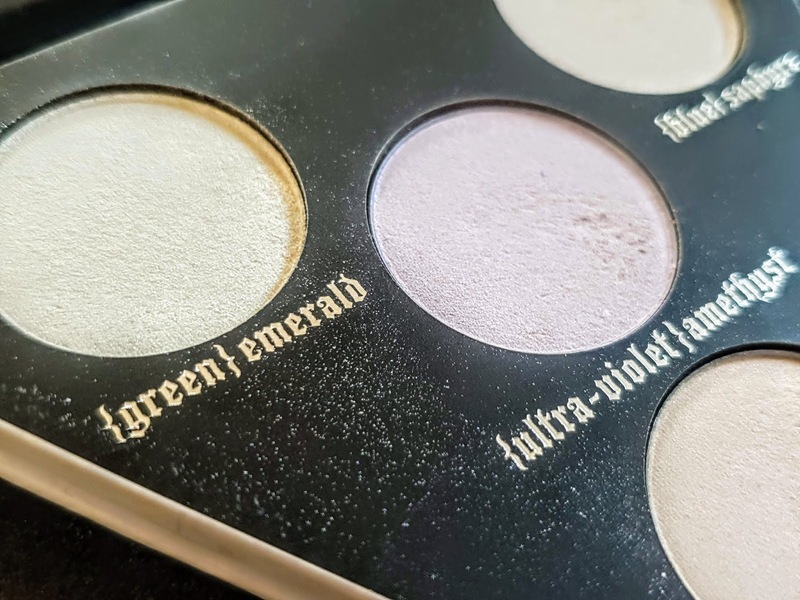 This palette was 7 years in the making as it was actually developed as of one of Kat Von D's dream products. The palette itself is a work of art, it looks very shiny and holographic that it stands out nicely. It is a right pain to take photos of though so I am sorry that the photos don't look brilliant, it took a while to even get these photos haha. 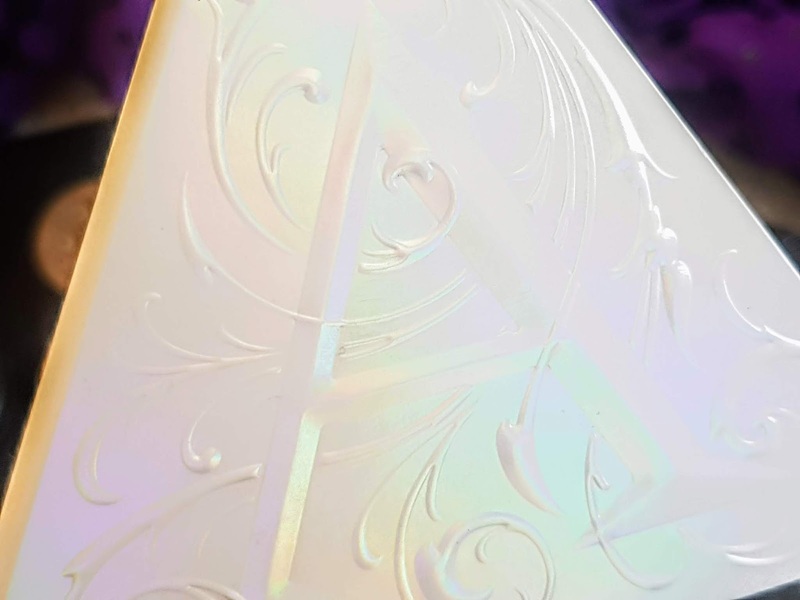 Inside the palette, itself is a small triangular mirror and also 4 holographic inspired highlighters. The pan size for the highlighters is quite small compared to other highlighters on the market but don't let that fact fool you. Each highlighter contains 1.53g of product compared to Kat Von D's other single highlighters which contain about 4.8g of product. Both versions cost £25 but with this palette, you get more for your money as you get a total 6.12g of product for your money! I do love the packaging but it is a pain to take a photo of haha! I do love the half diamond design and also the fact it has a mirror. For £25 I do think its durable enough and feels worth the money! 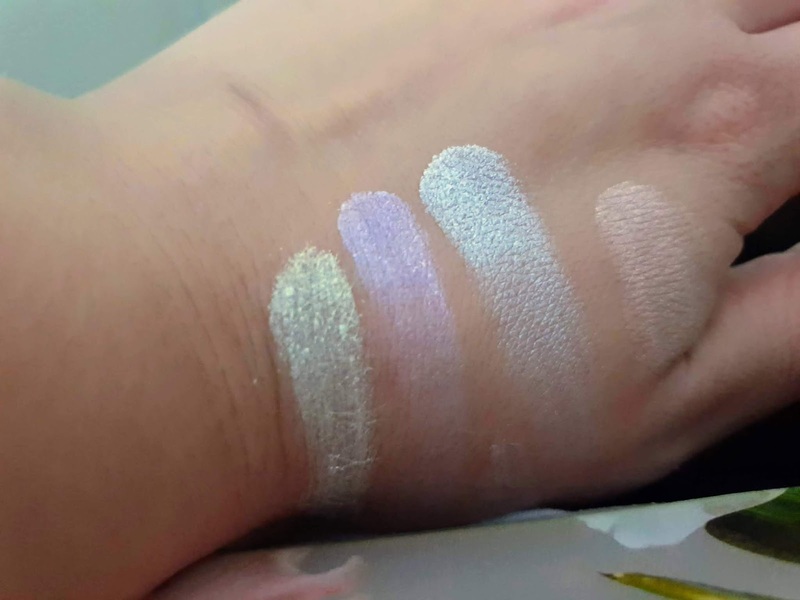 The highlighters feel an immeasurable quality and feel almost buttery as they are very smooth. The texture of these is very much like her eyeshadow palettes shadows. You can easily build up these highlighters on their own or with other beauty products. Only a small amount of the product gives so much pigmentation which is brilliant. Each of the highlighters is equally as good and give a lovely amount of colour and iridescent shimmer with its sparkles. Depending on how you use these the results will be different since they can be used on their own or mixed with eyeshadows or even lipstick. Love the fact that these give a lovely dimensual shimmer! They are bright and even look lovely used with an eyeshadow or even as an eyeshadow. They give a dewy looking effect and also work wonders with a contour. Even with or without a primer or a makeup setting product these highlighters have no problem with lasting all day long! Can't fault them at all. I just love this palette and I am so glad it is in my makeup collection. Not only does it look phenomenal but it has a lovely selection of highlighters to choose from and since you have a few to choose from it makes it more versatile. My personal favourite shade in the palette has to be 'Amethyst' as I just adore the purple shimmer, it is just beautiful. The best thing about this palette is that it can be used in a variety of ways including as a highlighter for cheekbones, nose, cupids bow or even collarbone. It can be used together with other products including eyeshadow to add sparkles and richness. Have you tried any Kat Von D beauty products?